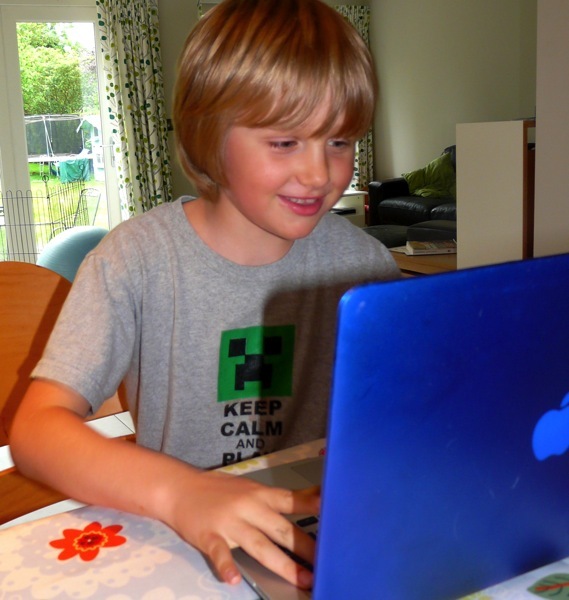 We’ve been homeschooling in very relaxed way this year. 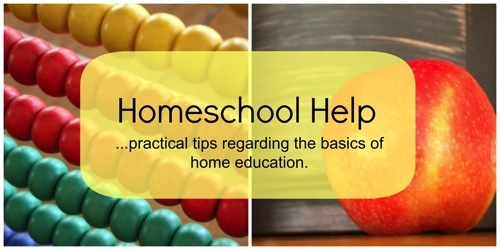 Surprisingly, I’ve probably put in more homeschooling “hours” than ever – unschooling is more parent-intensive than I’d anticipated. But both the children and I are thriving. I’ve started dozens of blog posts about what we’ve been doing, so I thought I’d better get around to finishing one. I’ll start with sharing how C(10) and J(9) are learning how to write. 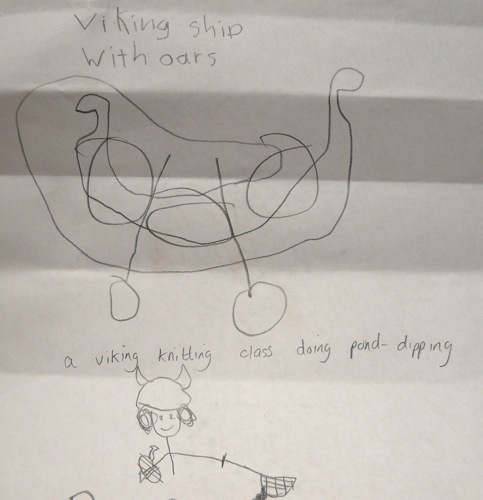 I don’t require any writing as part of my children’s everyday learning. Nor do we study grammar or spelling as separate subjects. I don’t teach them how to write five paragraph essays, but they love to debate ideas and make reasoned arguments. I never ask for written narrations, but after we read about the slave trade, or how Henry VIII broke with the Catholic church, for example, there’s plenty of spirited discussion. And we read and listen to so many fiction books together that we’re always comparing and contrasting plot structures, analysing character motivations and discussing the use of different viewpoints as we chat about the novels we’ve enjoyed. Despite – or perhaps because of – this, both C(10) and J(9) love to write. Here are some examples of the types of writing they’ve been doing recently. C(10)’s passion for the Divergent books and movie has inspired a ton of learning. She spent most of April reading Divergent fan fiction, and last week she uploaded the first instalment of her own story to FanFiction.net. An hour later she excitedly announced that 28 people had read it. The following day she added another instalment. Readers left reviews. More people read it. Her story is now over 3000 words long. It’s had more than 1000 views, and it’s been followed and favourited by readers. Writing, like any skill, improves with practice. C(10) knows her words are going to be read and appreciated by real people. She gets almost real-time feedback. No wonder she spends so much time writing! 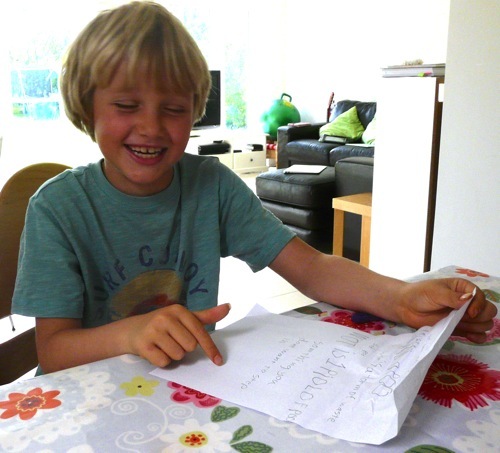 C(10) has also just started writing a fantasy novel, “Circle of Fire”. (Actually a trilogy, apparently.) The title was inspired by this brilliant name generator site recently shared in Julie’s Daily Writing Tip. 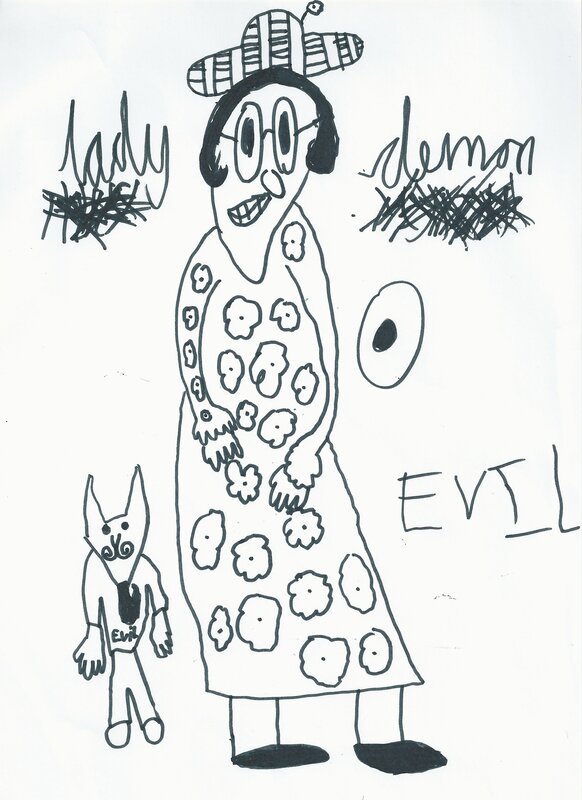 C(10) is at the faltering ownership stage of writing – she often enjoys writing alongside an adult. Not so long ago, the idea of that adult being me was met with a derisive snort. Then for a year she was mentored in writing by an adult friend of ours, until the friend moved away. So when C(10) recently asked if I could help her write a story “in the way that Gaynor used to” I did a little jig inside. I like this flipped way of working. Instead of me teaching C(10), C(10) is showing me how to help her. “Okay, so now we set the timer and I do a free-write about the characters”, she says. “Now I read you what I’ve written and we talk about it.” It’s fun being part of her writing process. “Shall we make up Mad Libs?” J(9) asks enthusiastically, several times a week. We all enjoy Mad Libs, so C(10) and I grab our computers and join J(9). We each write a few paragraphs on any theme we choose, leaving plenty of gaps. Then we take turns eliciting from the others words to fill our gaps: “Adjective?”, “Verb?”, “Plural noun?”. Plenty of suggestions are offered for each missing word, and the writer selects their favourite. Then they share their story, usually several times, to much hilarity. 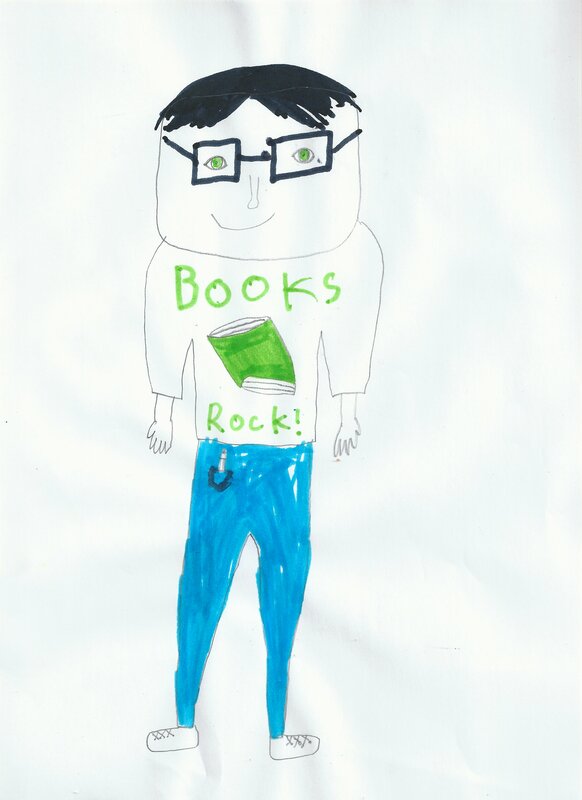 All the writing I’ve mentioned so far is spontaneously initiated by the children. Copywork, meanwhile, is part of our routine. C(10) loves writing out her favourite poems, and paragraphs from books she loves. She does her copywork by hand, using colourful gel-pens. Because J(9) struggles with the physical act of writing, I tend to forget that as he copies he is also learning how to spell, punctuate and use good grammar. Although he needs the practice, the laborious process of writing by hand makes it difficult for him to copy more than one short sentence at a time. I think of his last blog post – beautifully conversational and funny, but with barely a comma or full-stop (period) in sight. “I wish there was spell-check for punctuation,” he said. Copywork will help , but I expect J(9) will learn to punctuate when he feels the need, just as he taught himself to read and spell. He knows I’m eager to help whenever he needs me, but he needs to do things his way. Both my children choose their own copywork. Sometimes I strew resources, like websites with quotes from their favourite books. Or I buy kindle copies of their favourite audiobooks, like Anne of Green Gables or the Hitchhikers’ Guide to the Galaxy series. Often I do copywork alongside them – writing out great literature is always inspiring. 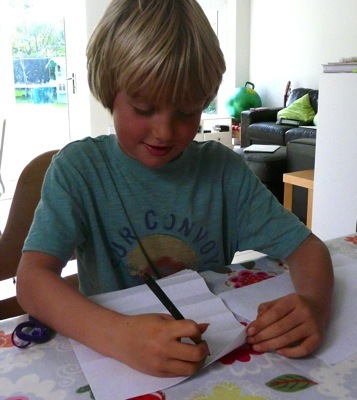 What are your children’s favourite ways to write? 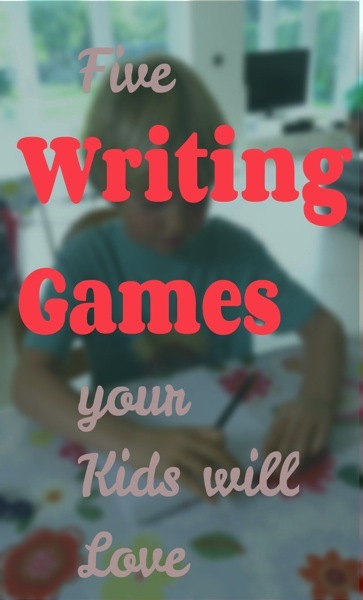 For more writing inspiration, see 5 Writing Games Your Kids Will Love. My suggestion whenever a child hates anything is to take a complete break from the current routine and have some fun. Here you will find genuinely fun games that adults will enjoy playing as much as children. In fact several have been enjoyed by adults since Victorian times or even earlier. 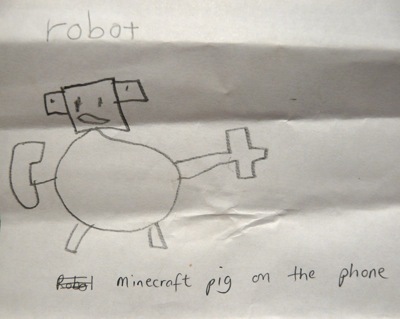 My mildly dyslexic and dysgraphic son adores them too. Each player starts with a blank sheet of paper and pencil. We use A4 (letter) size, portrait orientation. The game works best with three or more players, but we have played with two on occasion. At the very top of the paper, each player writes the name of a male. They might choose a historical figure, a cartoon or nursery rhyme character, a pet, a famous actor or even someone in the room. Each player then folds down the top of their paper to conceal what they’ve written, and passes it to the player on their left. Each player then writes down the name of a female on the paper that’s just been passed to them. Then everyone folds over and passes their paper again. Once the consequence has been written, everyone unfolds the paper they’re holding and takes turns reading their story aloud (usually accompanied by loud guffaws). I’ve described Consequences as we’ve always enjoyed playing it. You can, of course, modify it however you choose. A popular variation is to add one of more adjectives before each of the male and female characters. You might also add adverbs before “he said” and “she said”. We played a version of Consequences at my baby shower when I was pregnant with C(9). I still chuckle when I look back on the scenarios my friends came up with for our baby. Like Consequences, each player starts with a blank sheet of paper and a pencil. Each person writes a phrase or sentence at the top of their page, then passes it to the player on their left. Each player now draws what’s written on the page they’ve just received. Then they fold down the paper so that only their picture shows, and papers are passed to the left again. Next, each player writes a phrase or sentence describing the picture they’ve just been given. Then fold down papers again to reveal only the last piece of writing, and pass papers again. Keep going until there’s no room for any more pictures, then unfold the pages. Have fun comparing each original sentence with the final drawing and then following the metamorphosis in between. Like Consequences, Telephone Pictionary becomes more enjoyable the more you play it, as players intuitively discover what makes for the most entertaining denouements. Bad drawing helps. Anyone too good at drawing should be sat next to someone with a talent for imaginative interpretation! 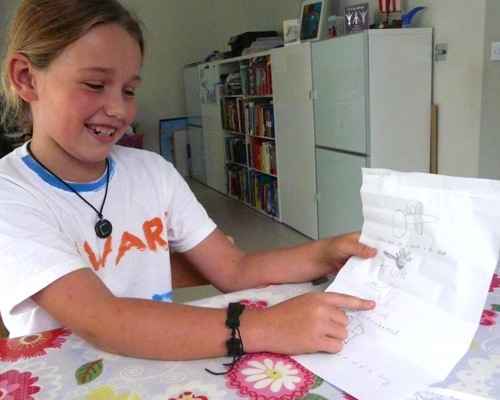 Any child who can read and have a go at writing can enjoy Telephone Pictionary. I don’t worry about spelling – children will naturally want to write legibly and spell accurately to communicate their meaning, but if they have to give a whispered translation to the player to their left, it’s okay. This one can be played by all ages but will yield more entertaining results with slightly older children. Once again, begin with papers and pencils all round. Each player writes a question they want the Oracle to answer at the top of their page. Papers are then passed to the left, and each player makes up an answer to the question they have been given. Players then fold the top of their papers over, concealing the original question, and pass papers round to the left again. This time, each player makes up a possible question which could be answered by the answer they see written on their paper. Players fold down and pass papers round again, and answer the question they see written. Continue to the bottom of the page, ending on an answer. At the end, each player unfolds their paper and reads out first the original question and final answer, and then the in-between steps. The more off-the-wall, yet detailed, the questions and answers, the better this game is. Kids will intuit this as they play and strive to come up with increasingly creative and linguistically complex questions and answers. Check out Deep Fun’s Parlour Games for a hilarious example from an actual game of Telephone Oracle. The template story game Mad Libs involves slightly less actual writing than the above games, but it compensates by requiring players to provide specific parts of speech. And the resulting stories are equally entertaining. You can buy books of Mad Libs (we have Kids’ Mad Libs and Best of Mad Libs) or print off your own for free from one of these websites. 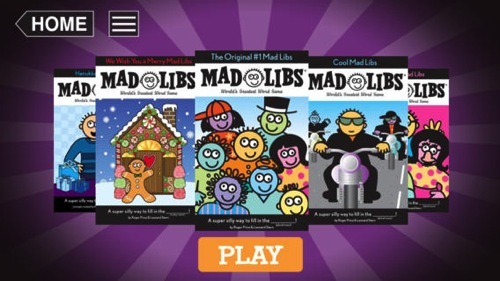 There’s even a Mad Libs iPad app. 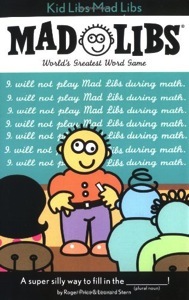 Find out more about how Mad Libs was created, and how an eavesdropped conversation led to its unusual name, at Wikipedia. This one’s not a game so much as a simple and lovely ritual. Write a short note to your child and leave it on her pillow. Thank her for something helpful she’s done recently, acknowledge her for something (tangible or intangible) she’s been working on, or tell her how much you enjoyed doing something with her. 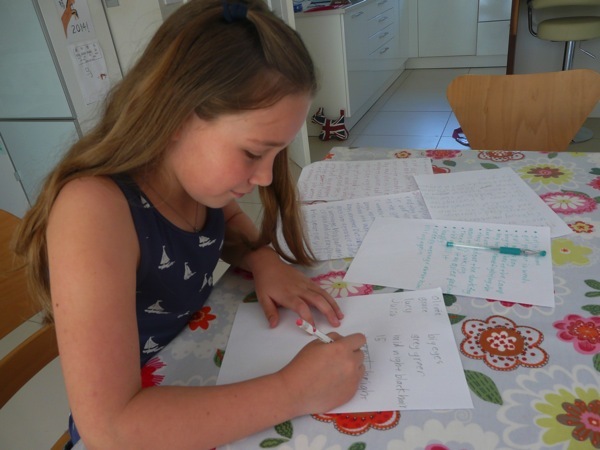 End your note saying that you’d love a reply if your child feels inspired to write one. If you he does, write back in a day or so. If not, write to him again anyway. 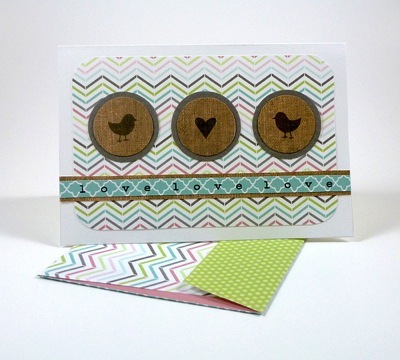 Show your child how special it can be to communicate by hand-written letters. Each person could pick the name of another family member to write to out of a hat. Rotate so that everyone writes to each other family member. 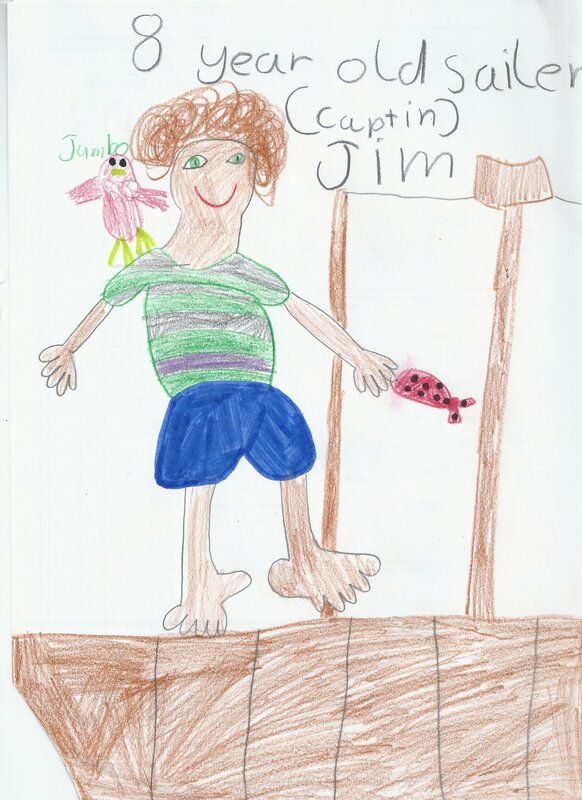 This is one of the reasons I don’t do any formal format writing with my elementary-aged kids. Instead we use freewriting, conversation and games that encourage them to connect with their inner voices. What I like about the writing games listed here is that the “puzzle” is to have as much fun as possible. This playful state fosters creativity and self-expression – both essential components of writing. I’d love to hear from you if you try out any of these games. And do please let me know of any goodies I’ve left out! 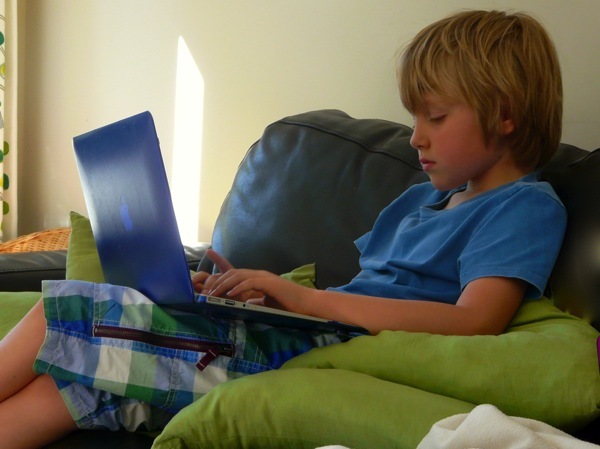 For more fun writing ideas see Unschooling Writing.